Tripping the Light Fantastic: Miu Mius for you? 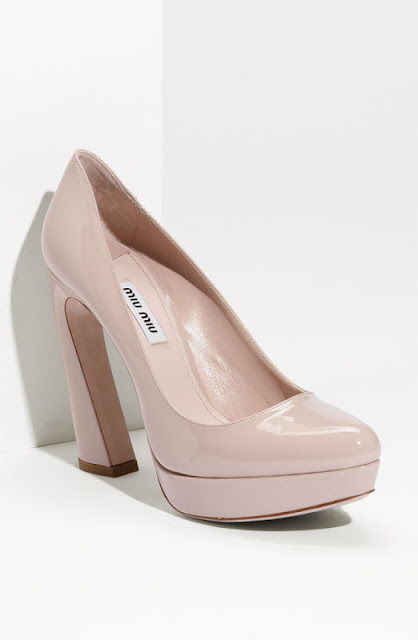 I found these beautiful Miu Mius on sale from Nordstrom recently but alas they do not fit correctly. Apart from fit, they are perfect - nice heel height, platform-assisted comfort and for someone who suffers from pronation, a solid and sturdy heel. Before I return them, I am offering these up for sale at cost - because in all likelihood these will disappear in the depths of some warehouse to be lost forever. Approx. heel height: 4 3/4" with a 1" platform (comparable to a 3 3/4" heel). Approx. heel height: 4 3/4" with a 1 1/2" platform (comparable to a 3 1/4" heel). Payment by Paypal only. Shipping to other countries possible but s/h will be extra. Email if you are interested. I will return these by post to Nordstrom on Friday, 20 July 2012 if there are no takers.